Our Story - Garden Complements, Inc.
Born out of tasty, homemade sauces that were the hit of backyard barbecues, Garden Complements is a contract packing and private label food processing company offering concept-to-shelf products and services. We offer a full line of our own signature brands including Heritage, Amigo, Campfire, Aussie Sauces and Gaetano’s. In 2014, Garden Complements became home to Curley’s Famous Barbecue Sauces, which are available for both retail and foodservice. Whether we’re matching your existing recipe or developing a brand new custom sauce, each batch is expertly crafted using the highest quality ingredients and packed into one of the many packaging options we offer. New ideas and technology continually enhance our capabilities. Contact us. 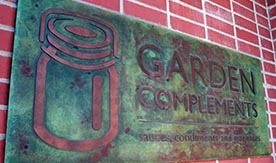 Garden Complements is Kansas City’s contract packing and private label food processing expert. We’ve been producing flavorful sauces, condiments, marinades and dressings for leading restaurants, retailers and food service companies for more than 40 years. We also provide a variety of services including research and development, order fulfillment and distribution.